Four years ago Wales were rated 117th in world football's Fifa rankings - but they could soon move up to second. Following their 1-0 victory over Cyprus on Thursday in the Euro 2016 qualifiers, Wales are on the brink of reaching their first major tournament in 58 years. And if results go their way they could move from ninth to above World Cup winners Germany and Brazil in October's rankings. So how can Chris Coleman's side - once ranked below Azerbaijan and Guyana - rise further up the standings? BBC Sport looks at how Wales could achieve it. This is the (relatively) easy part of the equation for Wales. If they can beat Israel on Sunday with a packed Cardiff City Stadium roaring them on, not only will they secure qualification for the Euros, they will also be guaranteed to be at least fourth when the next Fifa rankings come out. This is because some of the teams above them - Colombia, Brazil, Portugal and Chile - are playing friendlies rather than competitive internationals, for which fewer points are on offer. Even if they win their games, they would drop below Chris Coleman's side. Jump above Germany into third? To break into the top three, Wales need other results to go their way. Current third-placed team Germany can hold onto their spot if they win both their upcoming Euro qualifiers against Poland and Scotland. But even a draw in one of those matches for Germany would send Wales up to third - provided they beat Israel. Wales have already beaten Belgium in Euro 2016 qualifying - now could they muscle them out of second place in the world rankings? It could happen, Wales fans - but it requires Cyprus to do them a massive favour. 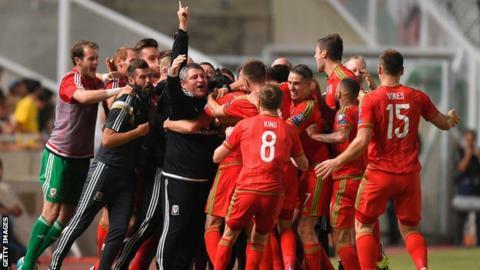 If the islanders can beat Belgium in Nicosia on Sunday night, then that - combined with the other results mentioned - would see Wales officially ranked the second-best football team in the world.